Since our Mom doesn’t have a blog I’ll take over this job. 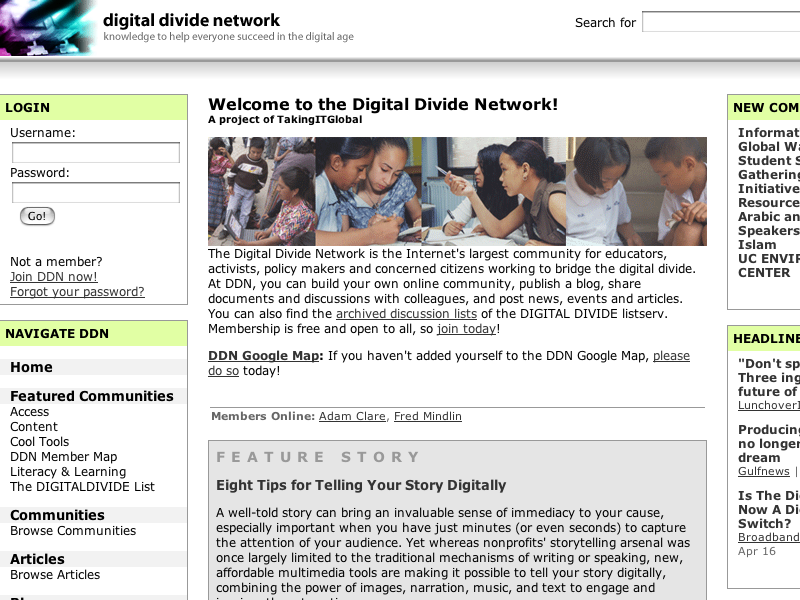 The web site my brother Adam works on, the Digital Divide Network, a project of TakingITGlobal, is an 11th Annual Webby Awards Official Honoree! Congrats to Adam and TakingItGlobal! Lindsay and I signed for a new house today! Here’s the same details I already posted over at our website clurko.com. The house is located at Dundas (HWY 5) & Walkers Line in Burlington’s Upper Millcroft neighbourhood. It’s a brand new Monarch town home that has already started framing. It’s going to be a great place to start our lives together. We’ve got lots of plans to modify the upstairs floor plan and and for upgrades we’re going to add, and we’ll post those soon. But for now, here’s a picture of a similar house up the road from us and a picture of our house as of April 15th. 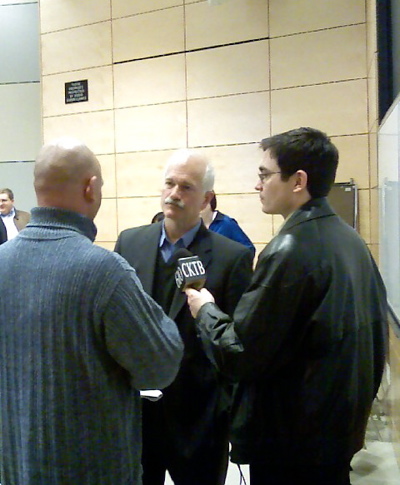 Jack Layton gave a talk to students and staff at Brock today. He talked about the NDP’s post-secondary education act, and about the need to help working families get by. Did you know that 3/4 kids in the Niagara region leave the region to find work? He also pointed out that he once carried around a laptop and gave presentations on climate change, if only he’d brought a long a camera. The NDP has lots of good ideas (National child car, housing issues, environmental policies, etc.) and a millstone of organized labour, but the issue that seems to be getting Mr. Layton the most traction is his stand against ATM fees. As an interesting side note: I was able to pick out most of the CAW members in the room from their choice of leather jackets and hair styles (none pictured). There isn’t much that distinguishes my car from a Honda Civic, but the rear disc brakes is one thing (well, technically two things) that distinguish my car from the average 2001 Civic. At 117,225 Km my rear rotors were covered with rust and made a grinding noise during low speed breaking. I decided that this spring when I changed my snow tires for summer tires a full brake job was in order, but that’s not cheap and I’m saving for a wedding. 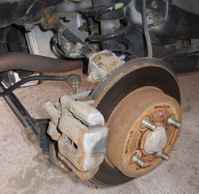 Thus I decided to do this myself, I have a Honda Civic Haynes’ Guide (apparently the US version had 4 wheel discs) and there are very few complications to the procedure – except rust! What I wanted to blog about was the parts themselves. Acura had the rotors in stock and were willing to sell them to me – for $160 each! I checked with Canadian Tire and they didn’t have rear rotors for the Acura EL or the Canadian made Honda Civic, but they did have rear rotors for the Swindon UK build Civic SIR for $19.00! This got me curious. I criss-crossed St. Catharines and found Motorcade Auto Parts – they were very apologetic that they only had their “Premium” rotors in stock at $88.57 a piece – compared to $160 from Acura I was very happy. That’s the main reason why I wanted to make this blog posting, the rotors are Motorcade part AIM 31406 – don’t buy the Acura rotors! Canadian Tire had break pads for the EL, I opted for the Monroe ceramics given that I was going to “save” the four hours of labour I splurged for high-end pads – the pads were about $80 for each end (front and rear). You are currently browsing the iMatt :: The Blog of Matt Clare weblog archives for April, 2007 .